1.1. South frontage has the Mountain Star #1 = coming prosperity. 1.2. Although this is an auspicious sector. However, do take note that this #1 is a mountain star. Thus, ideally, best that the frontage faces another unit in another block. And preferably no water position. 1.3. 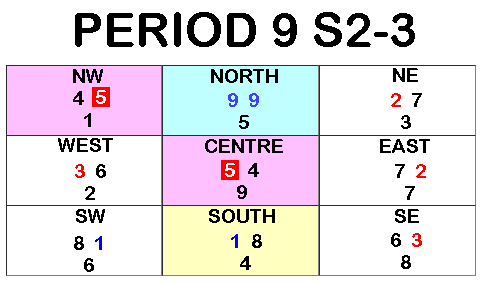 Usually a block would have a unit facing S2-3. And on the opposite site units face N2-3. Why don't you also check out units that face N2-3. The reason is because, N2-3 under Period 9, has the double auspicious #9's current prosperity wealth stars at it's frontage. 1.4. While for a South facing unit; North sector is usually the kitchen or service yard or air-con ledge or even missing corner (if any). Thus often the term "Current prosperity wealth luck is wasted at the rear of this unit". 2.1. For a South facing unit, usually the living room or master bedroom can either be at one of these sectors. 2.2. It is still preferred that the master bedroom is located at SE. As SE has the auspicious water wealth #1 = coming prosperity. While SW has a #3 = quarrels, conflicts and legal entanglement. Even if SW is suitable to a West group person. 2.3. Some Feng Shui practitioners overlook Para 2.2. Thus, may simply say that SW suits a West group, so make it their master bedroom. So long as the bedroom is balanced and #3 neutralised, then this is acceptable or OK.
3.1. The nasty Mountain star #5 = misfortune/sickness is located at the centre-point of the unit. 3.2. Thus it is preferred that this #5 is locked up. Thus excellent if it is in the household shelter. 3.3. Consider twice if the unit has clear-space at the centre-point of the unit. Else, may expect lots of misfortune/sickness to be-fall the unit. 4.1. For a South facing unit, often, there is a high unlucky chance that the kitchen/stove is located a NW. If so, this unit is inauspicious especially for the Male head-breadwinner. Search for "Fire-at-Heaven's" to understand why. 4.2. Good it this is not a bedroom or study. As the other water star #5 = misfortune/sickness is located in this sector.